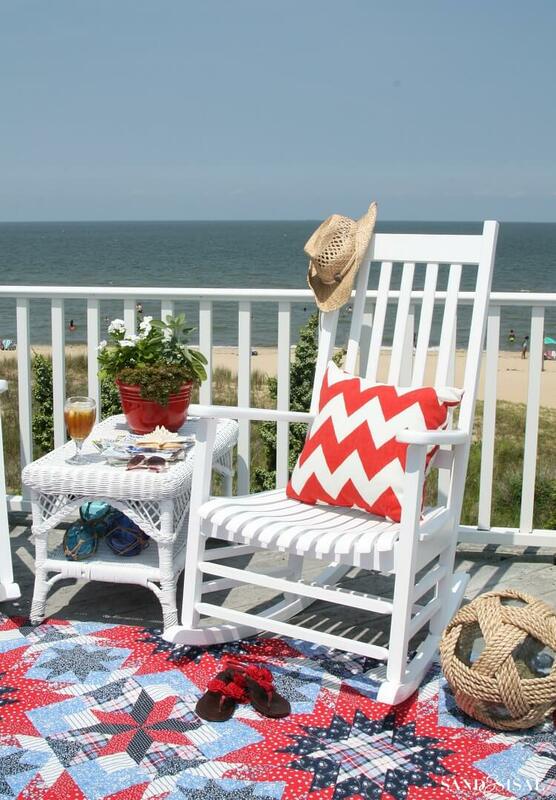 Some of the best summers are spent on the porch, sipping iced tea and dreaming of the ocean. As you stand on your wooden porch, it’s easy to imagine yourself on the deck of a ship, leaning over the railing and taking in the sea and sky. 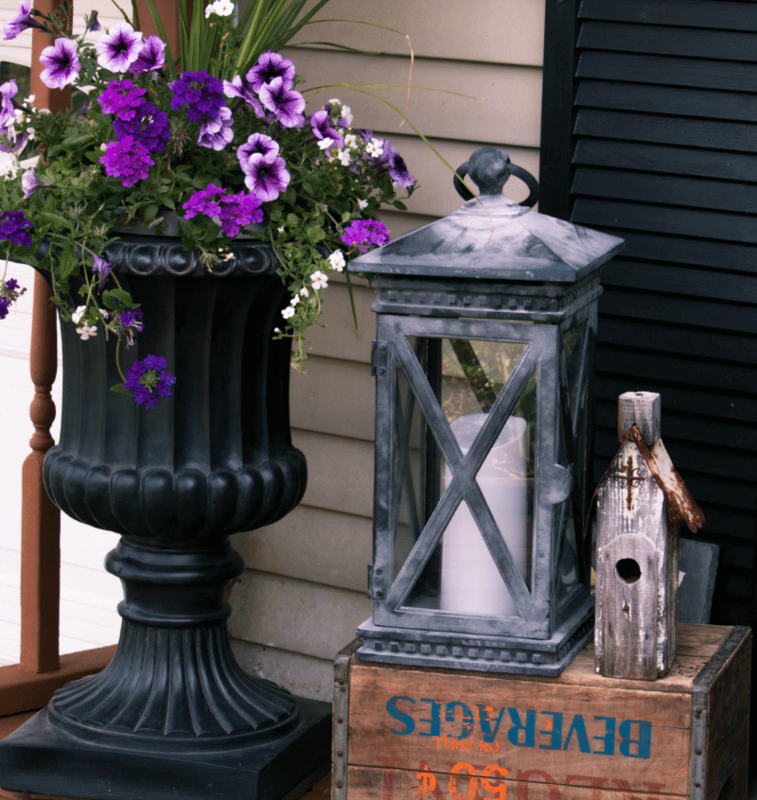 Even if you don’t live near the beach, you can still bring the summer fun home with clever beach style porch decorations. 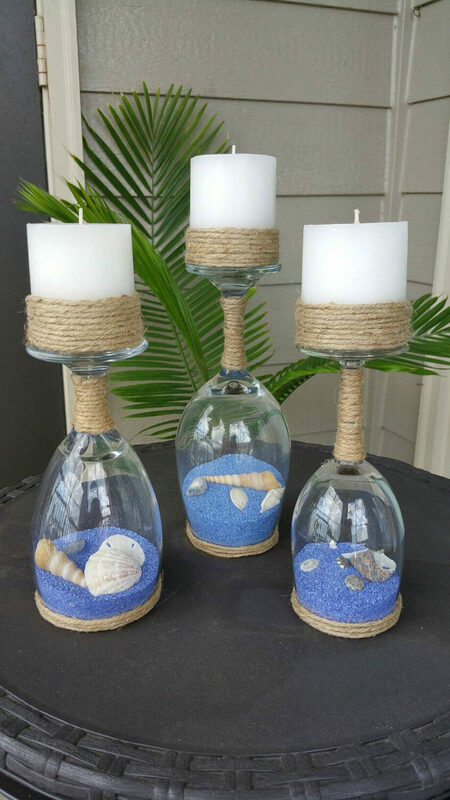 Beach style decorations are themed around ocean creatures, repurposed sailing items, and plenty of rough sailing rope. Bright color palettes are used to breathe life into old objects, while bold stripes and patterns capture the brilliance of beach umbrellas and towels. 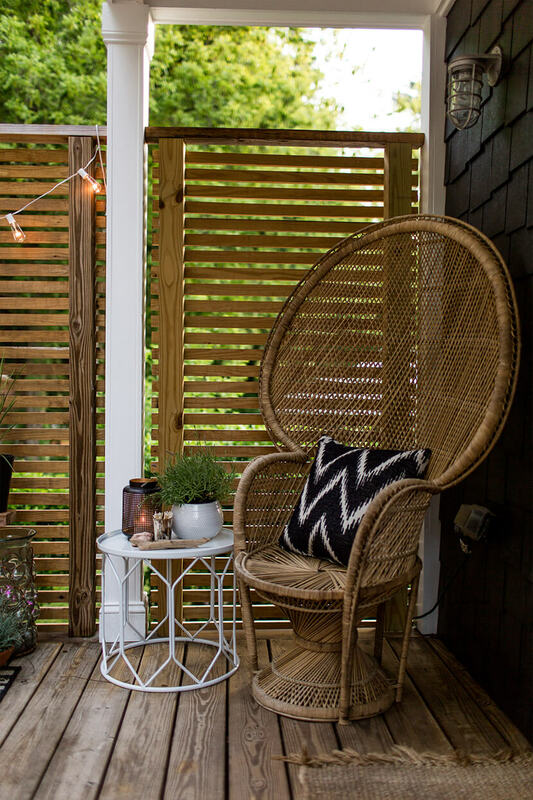 A little bright paint, a few wall hangings, and some popping accessories can turn any porch into the seaside deck of your dreams. Painted wooden buoys can quickly add a touch of ocean fun to your beach style porch. Bright colors and authentic materials come together to create a decoration that looks like it’s already been out to sea. 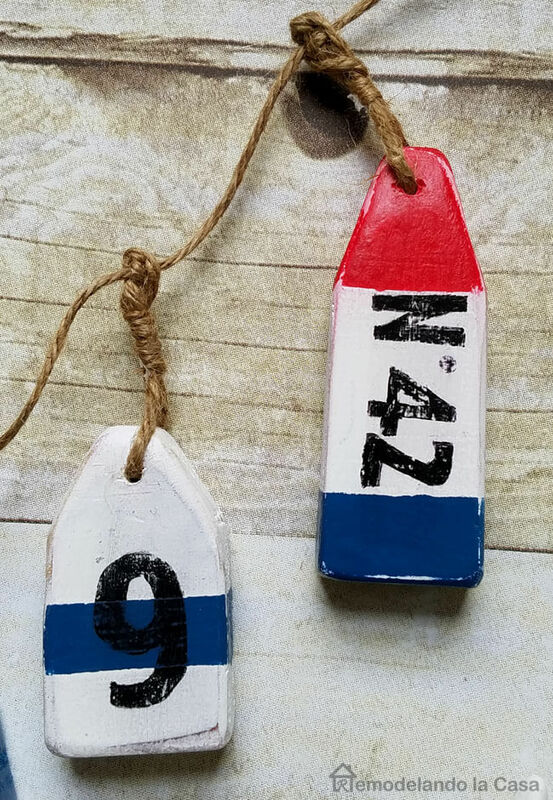 These tiny buoys could adorn your banister or hang from your door for a subtle but charming nautical feel. 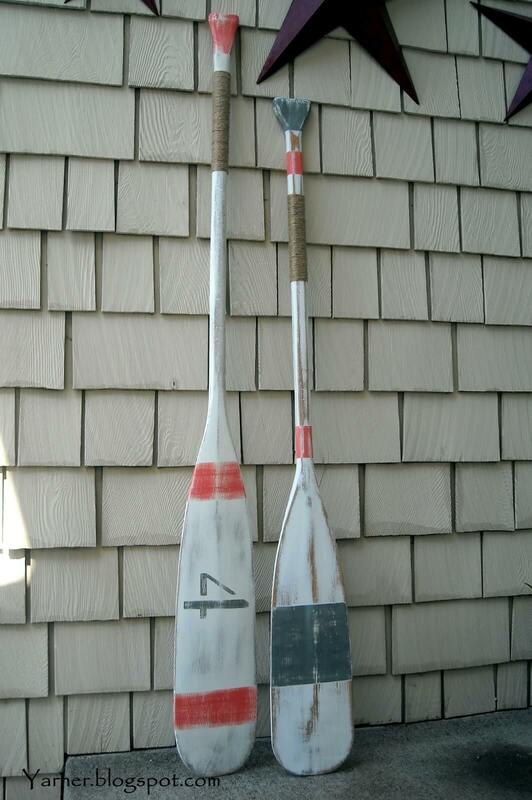 These flat oars have probably paddled their last journey, but they still make an eye-catching beach style decoration. The faded, washed-out use of classic nautical colors gives a relaxed and lazy summer vibe. Prop the oars in the corner of your deck, or mount them by the door for a bold, beach themed statement. Sometimes the look you’re going for is all in the color. This bright turquoise side table immediately calls to mind a cool, relaxing trip to the seaside. The tall candle holder might have been used at a captain’s table, and supports a sea-colored scented candle. In brilliant contrast to the shades of blue and green, a bright orange watering can serves as a clever flower vase. A navy blue porch sofa sets the stage for this beach-side scene. Bold striped throws pop out of the background and provide a way to stay warm against a chill ocean breeze. The key to this design is that each color is matched somewhere else. 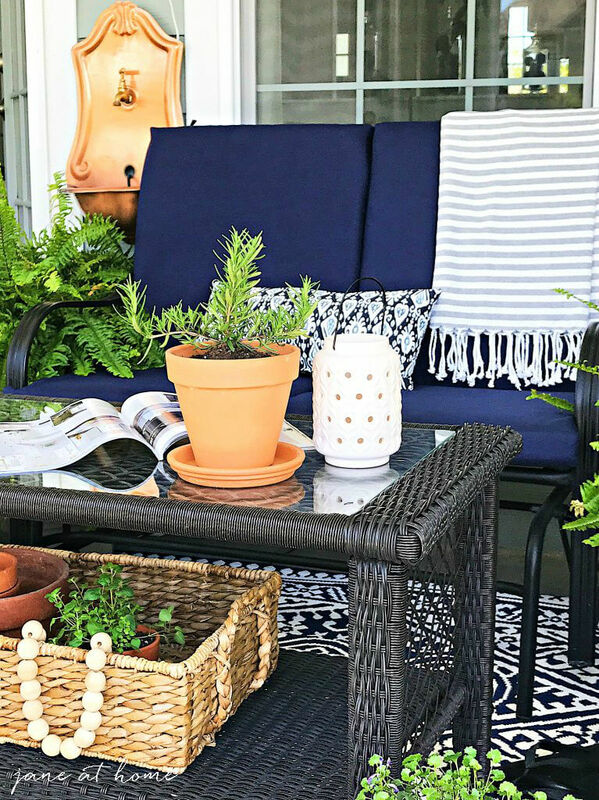 The cool blue navy and the warm shades of the wicker basket are both brought to life by the presence of verdant, well-tended plants that could have grown in an enchanted lagoon. Red, white, and blue are naval colors, but they’re also patriotic; these two themes come together for this bold and joyful porch design. 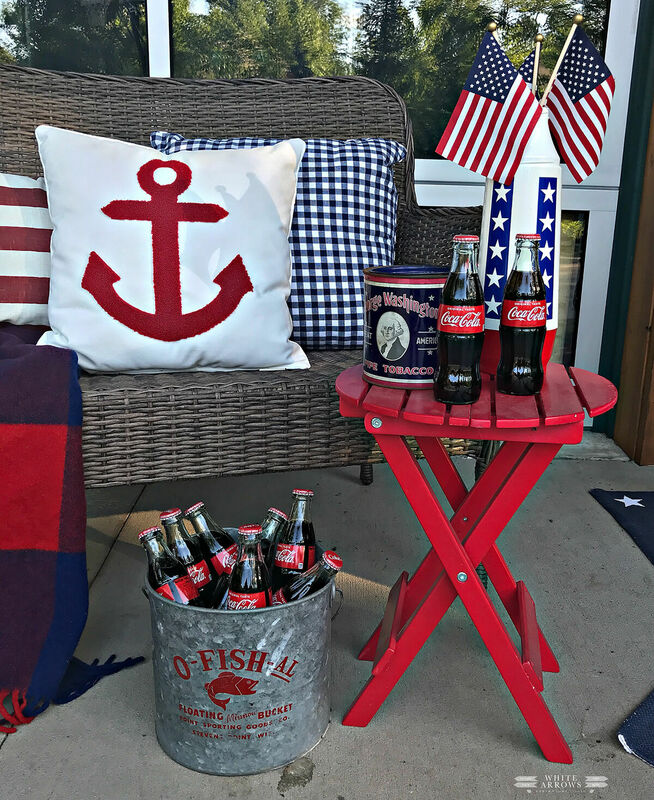 The real star of the show isn’t the nautical throw pillows or the bright red end table; it’s the stylish fish bucket that’s been repurposed to hold ice cold drinks for guests to enjoy. 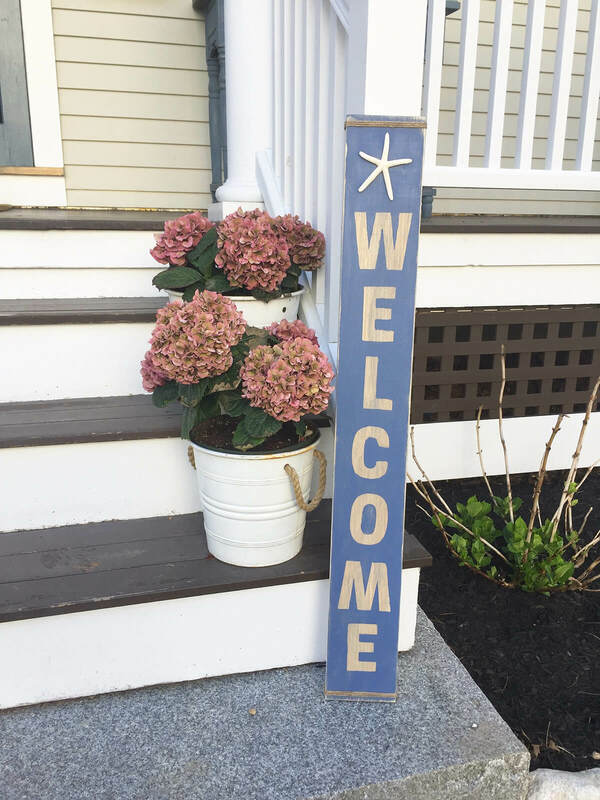 This handmade wooden sign is propped cheerfully against the porch railing with a message that will make guests feel right at home. The off-white starfish that adorns the top is tasteful and whimsical. This piece uses a deceptively simple design to express a deep love of the ocean and its shores. This classic storage chest brings an ocean feeling all on its own. The top is emblazoned with a happy, descriptive message and an adorable starfish icon. The sandy appearance of the chest looks great against the light wood of the porch railing. 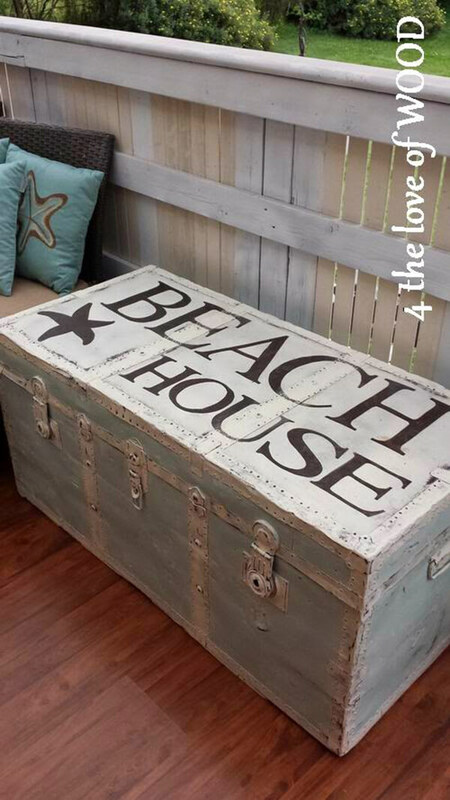 This decoration also serves as a place to store blankets, beach toys, or anything else a beach style porch might need. Teal is the color of summer dresses, beach towels, and the ocean when the sun hits it just right. 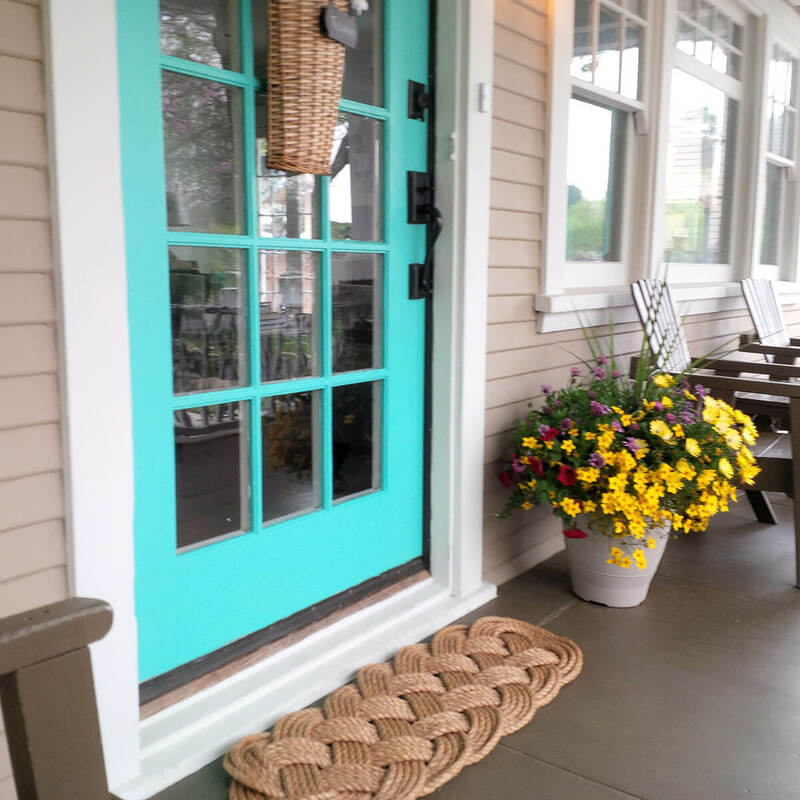 This brightly painted porch door stands out from the sandy base color of the house in a decidedly beach style look. 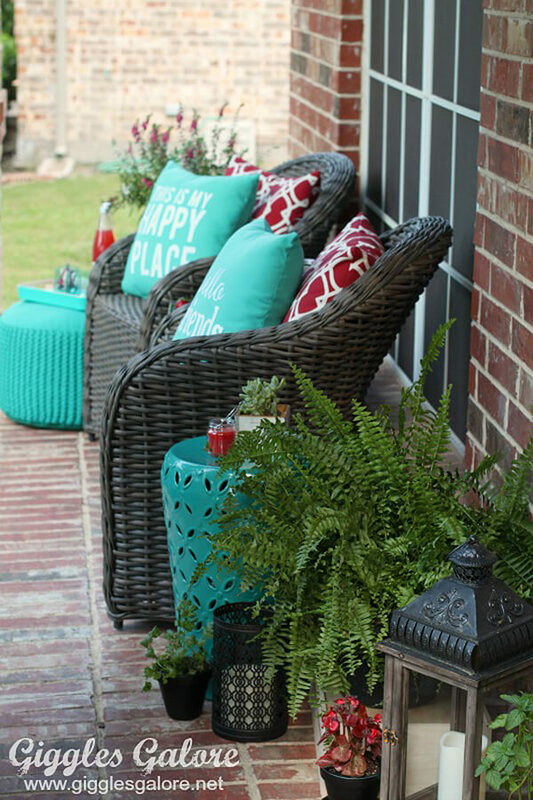 Teal colored porch accessories could be used to compliment the door and really make this design pop. Beach towels have forever made bold patterns a part of the beach style palette. This design manages to capture the beach feeling with a completely unique take. Carefully chosen shades of off-white and off-grey are reminiscent of weathered buildings along the harbor. The circular, repeating pattern ripples across the deck in a cool, collected, and eye-catching statement. Tan walls and white trim give this porch a decidedly sandy look, which is emphasized by a tactfully placed oar decoration. The whitewashed wood resembles the sides of a ship or an old picket fence. 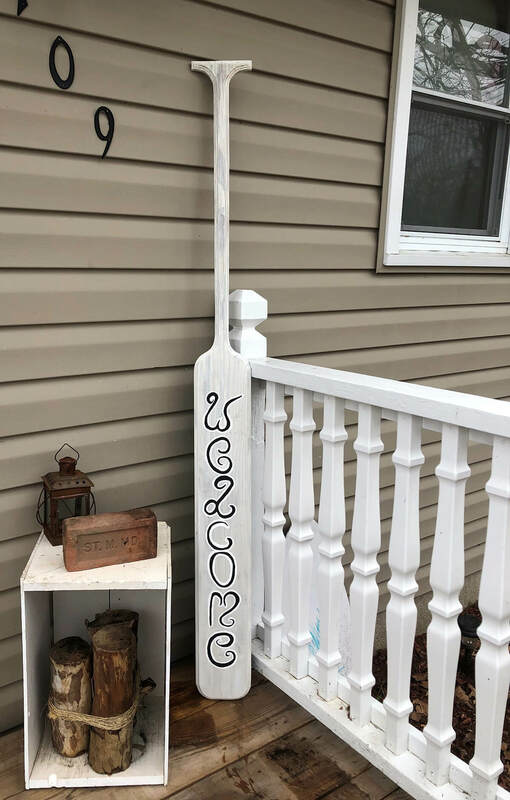 The beauty of this decoration is in its simplicity; the oar blends in with the porch railing, but when noticed, immediately greets the viewer with playful text. These clever candle holders use old wineglasses to capture a miniature ocean scene. The glasses have been turned upside down to encase a scene made of colored sand and seashells. When the candle is lit, the light will flicker off the glass and create an enchanted visual effect. This design contrasts a cheerful and boisterous shade of teal with a warm cherry red. Red throw pillows feature a beach-towel pattern and highlight the natural color of the faded brick background. Slightly darker teal end tables make a great place to set red candles and flowers for a beach look that definitely pops. 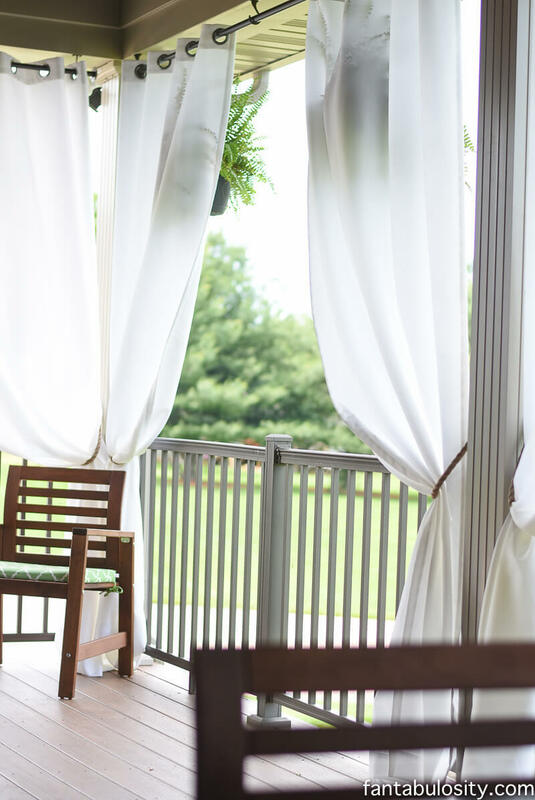 These soft white porch curtains block just enough sunlight to turn your porch into a cool, shady refuge from the hot summer sun. The curtains have been tied to porch support posts as if they were sails lashed to a ship’s mast. This porch would be a lovely place to hide in the shade while the sun warms up the ocean for an early evening swim. 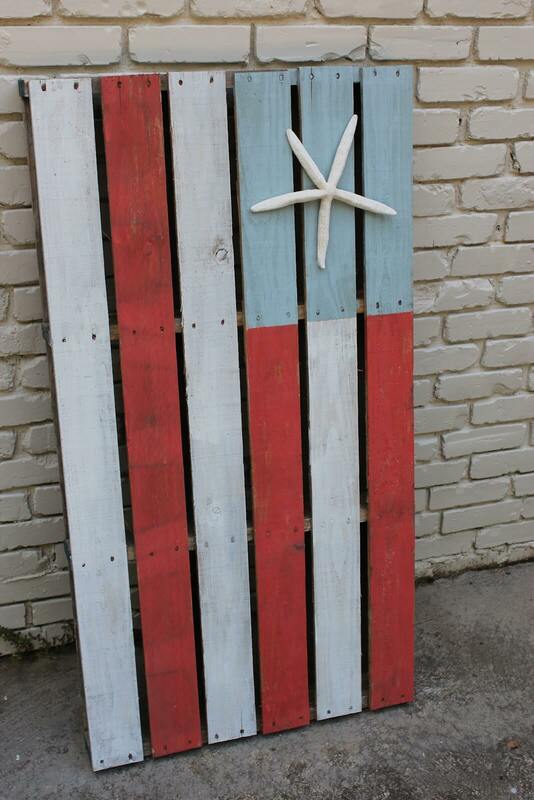 This decoration makes smart use of an old wooden pallet by turning each plank into a stripe on a flag. The clever placement of a starfish ornament gives the entire design an ocean theme. This style of decoration would look good hanging off a porch wall or even mounted on the railing. This piece combines all of the best elements of summer: sun, sea, and celebration. 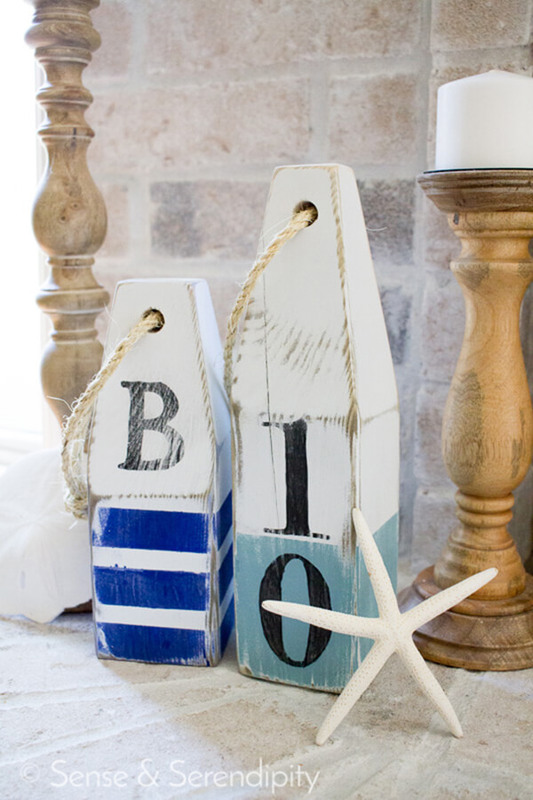 These wooden buoys stand out for their bold stripes and printed letters. The light colors blend in with the sandy brick background; the entire scene is reminiscent of a calm seaside day with fluffy clouds in the sky. As the sun sets, the candle might be lit, turning this porch into a place to tell stories of ghosts on the ocean. 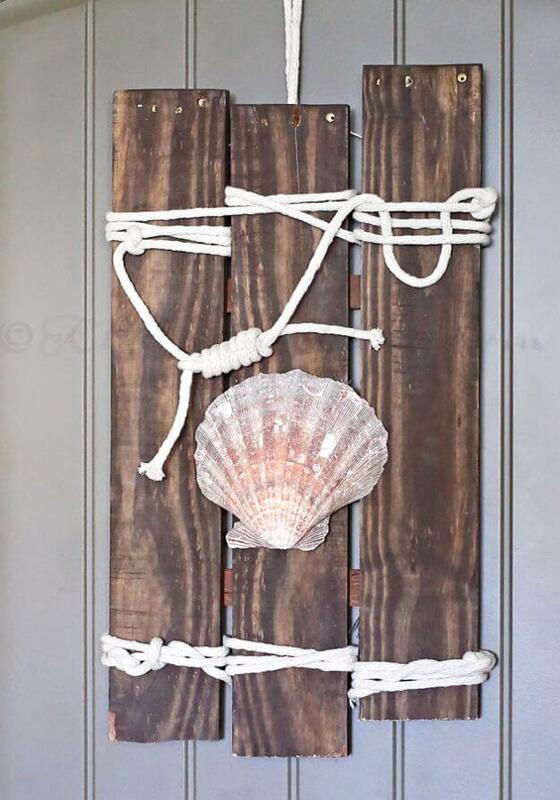 Seashells and skillful knotting work come together in this decoration to create a piece of beach-themed art. The contrast between bright rope and dark wood makes it easy to see the clever knot patterns that have been used. The giant pink seashell in the middle is a captivating ocean find that’s worth showing off. A similar design could be used to frame any beach artifact, like a small anchor or a fish-shaped ornament. Ships have been used to transport goods since they were invented, and wooden crates have washed up on beaches since the first time one fell overboard. This end table is made from a faded wooden shipping box set on its side. The brightly printed text on the side speaks of a history the box may have had before it came to rest here. In this scene, a ship’s lantern has been used to provide a classic, in-theme source of evening light. The high wooden walls of this enclosed porch space give a sense of safety and serenity. When the sun goes down, the soft glow of a string of beach lights will shine off the many wooden surfaces and create a warm, inviting atmosphere. This deck feels like it belongs on the beach of a tropical island. A high-back wicker chair makes a great place to sit and listen to the sound of crickets and nearby ocean waves. Ocean themed decorations often focus on starfish or seashells, but the ocean crab has a place in any beach lover’s heart. 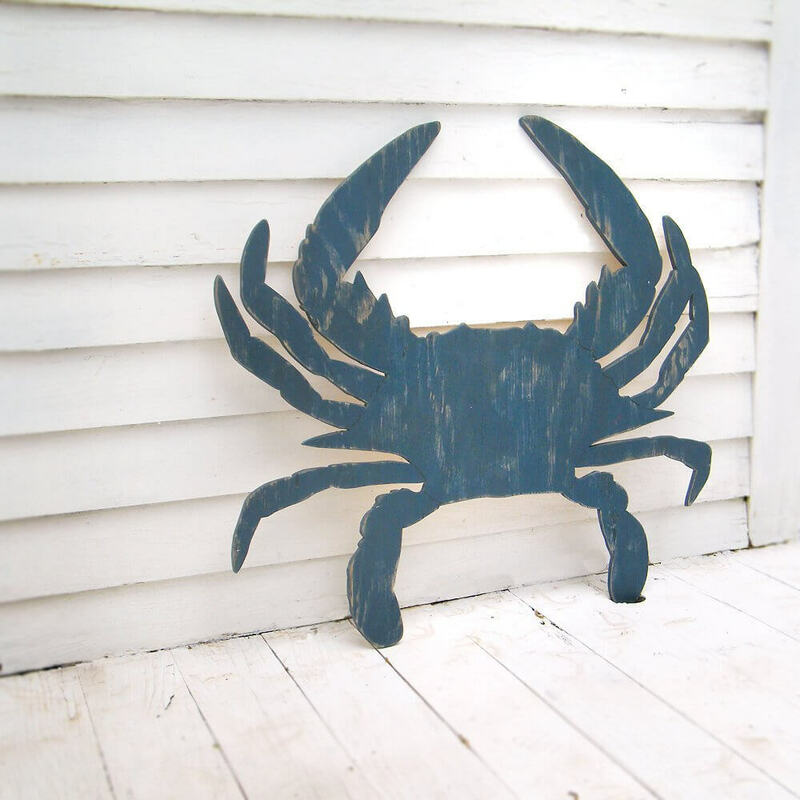 This large porch decoration honors the crab with a giant wooden cutout that quickly grabs attention. The dark blue paint stands out starkly against the white background. This kind of decoration defines its space and will give any porch a seaside feel. 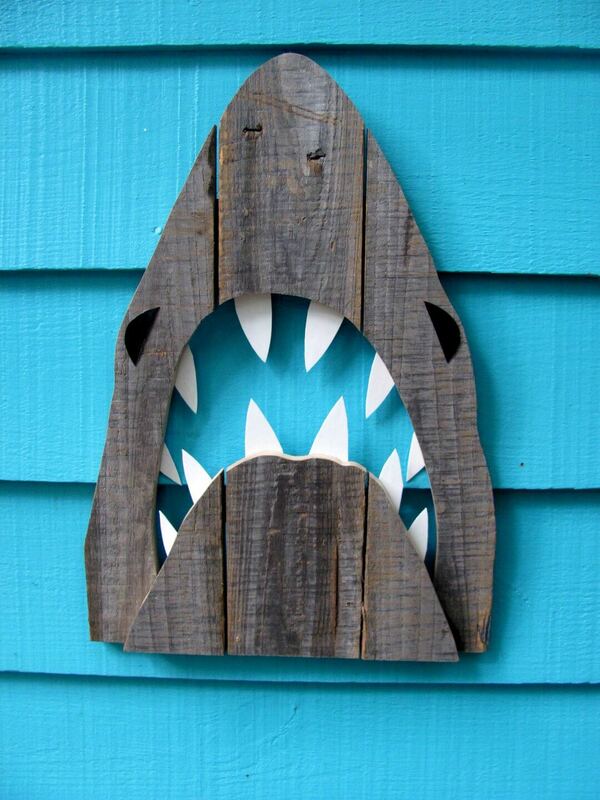 In a piece of clever woodworking, an old palette has been turned into the head of a ferocious shark. The bright white teeth add contrast, interest, and authenticity to the design. The brilliance of this piece comes from the way it takes advantage of the plain blue wall, using it as an ocean for the shark to swim on. 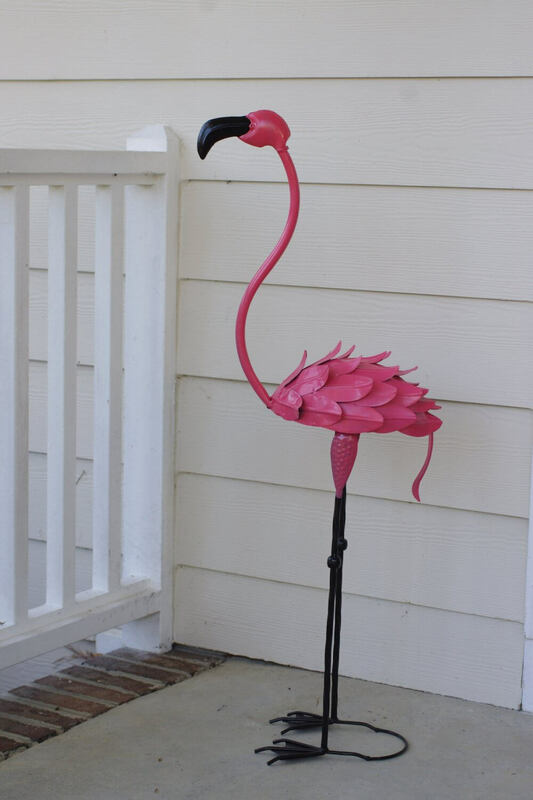 No summer scene is complete with out the brilliant pink presence of the classic flamingo decoration. This modern take features a minimalist, two-color design, with delicately ruffled feathers and a whimsically curved neck. 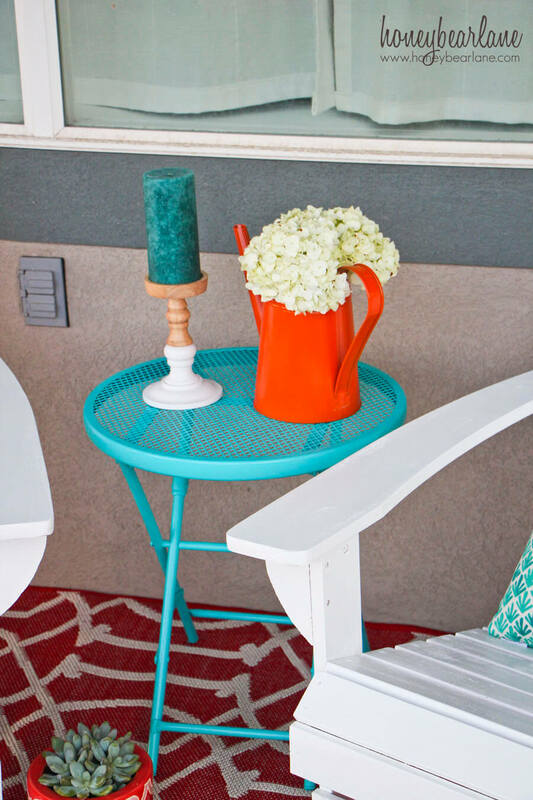 This decoration is reminiscent of a colorful beach toy, and is a good way to add fun back into a porch design. Something about wooden furniture painted a clean, bright white can give any deck design a summer vibe. The thin-railed banister gives a perfect view of the beach in the background. 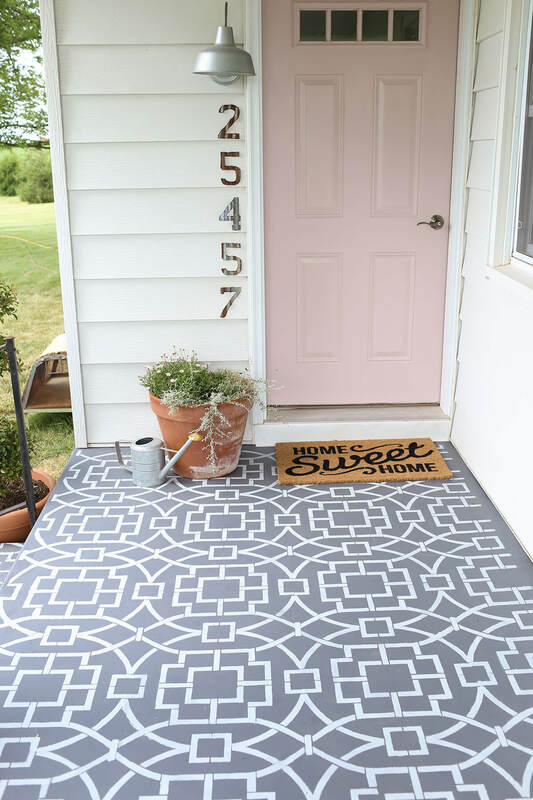 Patterned throw pillows and a colorful outdoor rug complete this simple but iconic beach style porch design.